It’s been a while since I have done a shameless self promotion post on this, so I guess today is as good a day as any to use this space for just that reason. Some of you newer readers may have absolutely no idea that I actually have a book out there. 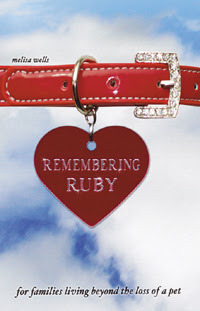 It’s called Remembering Ruby: For Families Living Beyond the Loss of a Pet. Although the target age range is 4-9 (ish), it’s really a book meant for families to share together. I can also say that many adults have told me that they read it and found the story to be very helpful. The book has two parts. The bulk of it is made up of the story–which is true, by the way–of “Ruby” (real name = Bijoux), our first beagle. Told from the perspective of my older son, the story is a portrait of the relationship between boy and dog. Of course there is the “loss” part, yet the story goes on to show that though loss hurts very much, you can grieve and then move forward, holding memories forever. The second part of the book is a short section for parents about helping young children deal with the loss of a pet. The book is full of actual family photos (in black and white), which help move the story along. The interior design AND the spectacular cover–which has garnered comments like “that is the most beautiful book cover I’ve ever seen!”–were both designed by my very talented sister*. If you have had a recent loss (I’m so sorry!) or if you know of someone who has (it’s a lovely gift), you can purchase my book online only, at great places like Amazon or Barnes & Noble. Thanks for your time and attention, and please…tell your friends! *Who does design work on the side, in case you were wondering. Business cards, signage, miscellaneous projects, whatever…and she’s a pleasure to work with! Need something done? Contact her at casajules (at) gmail (dot) com! I've known since the first day I read your block and I've read about the book on various websites. I made the decision that I'd buy it when our difficult time comes for us. It's my future comfort. When we signed up for Amazing Race this past season I asked you to set up my sister. I told her a bit about you and mention the book. She was like, "I know her. I've heard about her book." That was prety cool. I didn't know she did design work on the side. Or maybe I did? I don't know. But when I finally DO open my cafe somewhere-I'm totally contacting her. What a BEAUTIFUL BOOK COVER! haha. i loved this book, which my not-so-evil American twin was so kind to send, so the poor Europeans from across the pond could read it too. Most of us had to deal with the loss of a pet and this was just beautifully written. Sounds like a sad book! Don't wanna! Can't make me! you were the first person i thought of when my mom told me we were going to have to put our childhood lab, abbey down. we haven't done so yet, but it is coming, it's breathing down our necks, and every night, i page through that book, at 25 years old, and it brings happy tears to my eyes, knowing that it brings me comfort, and will bring me comfort, when the time comes. I didn't know you had a book. I will definitely get a copy to have when we need it. Previous post: It Takes A Lot of…Something!